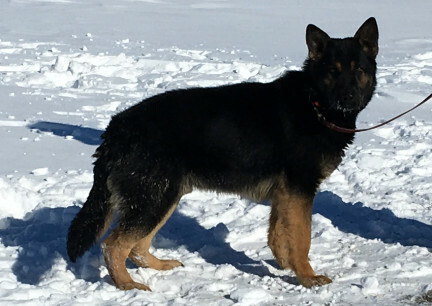 We offer AKC Registered German Shepherd Dog Puppies out of Our Own Working Dogs. Each of our dogs each has their own page, here on this website; each of their pages has links to the Dog Database Pedigree Site to show each of their Pedigrees that are FULL of Titled, Working, and X-Rayed (hips and elbows cleared) going back all the way to the 1800's when the Breed Began, as well as candid photos, information about them, and more. We are VERY Proud of our dogs. Each of our GSD is a Working Dog here on our 161 Acres. All of our puppies are played with, socialized, trained, and they are allowed to run around in LARGE pens before they leave us for their new lives. We also do a bit of Training with the puppies here. They will AT LEAST learn to Walk On A Leash, Crate Trained, Come When Called....and probably more, before they go to their new owners. You can find average/run of the mill GSD Puppies for sale anywhere, any day, but you WON'T find AKC Registered, German Shepherd Dog Puppies with the type of Impressive Pedigrees, with dogs that have CURRENT Working Jobs such as Border Guards, Police and Military Work, CERTIFIED Support Dogs, Schutzhund Titled Dogs and Pedigrees with photos of dogs in their background ALL THE WAY BACK to the 1800's, out of Working Line GSD Dogs, for this Price! Photo of Texas Tea and her Daughter, Teanna. We kept Teanna for our own. NAME YOUR OWN PUPPY! We are VERY Proud of our Kennel and the Puppies we produce. However, we also know that naming your own dog is part of the fun of a new pup. 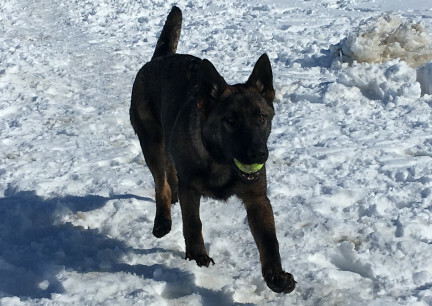 We would be Proud and Honored if you added our Kennel Name, Von Kazmaier, after your puppy's name....but we do NOT insist on it. Photo of Teanna as at 6 weeks old. Teanna is from our own breeding, Titus x Texas Tea. 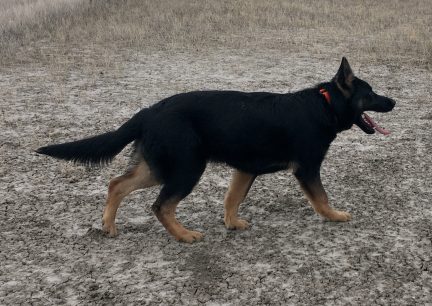 If you visit her own page, here on this site, you can see how nicely she is growing into a well build, and very smart, GSD. WE HAVE MANY CANDID PHOTOS OF EACH OF OUR DOGS ON THEIR OWN PAGES HERE ON THIS WEBSITE. NONE OF WHICH ARE TAKEN WITH THE DOGS 'STACKED', WE TRIED TO TAKE AND POST PHOTOS OF EVERY ANGLE OF EACH OF OUR DOG'S SIDES IN THEIR NATURAL MOVEMENT AND STANCES. "STACKED" = a Posed Position of a Dog for a Photo. This photo is usually (but not always) taken from the side. A Stacked photo can be taken from any angle. Stacked photos are taken to HIDE Faults. 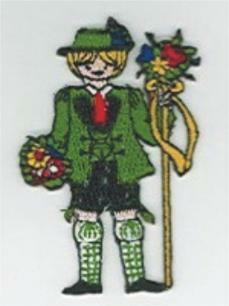 With 'Stacking', not only are the feet posed (that is twisted and turned correctly and set just where they should be, this what is known as 'stacked'), very often, the owner shifts the weight of the dog from front or to the back of the body, to cover up 'faults' the dog has in front or rear. Be aware of 'stacked' photos (especially when those are the ONLY photos shown) when you are looking at the parents of the puppy you want to purchase. Another 'photo trick' is when you only see photos of the dog sitting or if part of the dog is blocked from view. If the head is tilted back, probably weak, or lop ears. If the person in the photo has a tight grip on the dog, this can mean so many different things, one, if the dog moves at all, you will see it is not built correct, or it could be a "Kennel Dog" doing nothing but breeding so it is untrained...beware! Think of "Stacking the Deck". KEEP IN MIND: Stacking Dogs for the Conformational Show Ring is Correct and How It Is Done.....but if a breeder is offering no candid shots of the adult dogs....Beware! Photo (albeit a bad angle) of (in photo, not yet 6 months old) Tychicus, a pup we kept from Titus x Turquoise breeding in 2016. Texas Tea is really a GREAT dog! She is Pretty, Typey, Smart and is/was so easy to train. Texas Tes is Deron's Shadow and has his back out here on the Farm/Ranch. 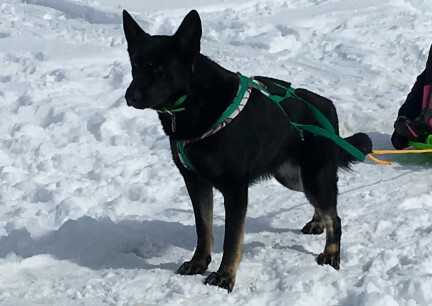 She has a GREAT Pedigree with current Working, Tracking, Military, Police, and Titled Dogs as well as all the way back to the 1800's when the Breed began. You can see all that from the link on her page. 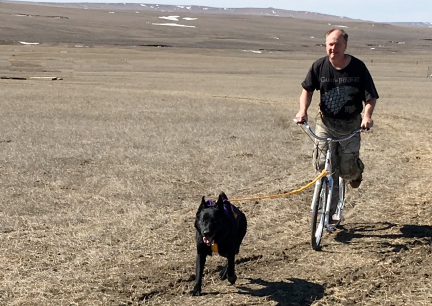 Photos are of Texas Tea pulling Deron on one of our Dog Scooters, and of Texas Tea 'The Skijoring Dog'. See many many more photos of Texas Tea on her on her page here on this site as well as photos of her 'sprinkled' all over this website. If bred to Tychicus, our plan right now, this litter should produce some TOTALLY BLACK PUPPIES. You might also look at the photos on Teanna's page, here on this website, for an idea of how Texas Tea's pups might turn out. Teanna is a Texas Tea Daughter we kept for ourselves. 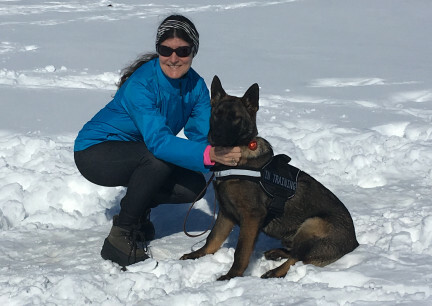 Each of these two dogs has a Far Above Average, that is a SUPERIOR Pedigree with current, as well as throughout, Police, Military, CERTIFIED Service Dogs, Tracking, SAR, Schutzhund Titled Dogs. Like all of OUR dogs, you can track these pedigrees all the way back to where the Breed Began in the 1800's on the Pedigree Data Site. 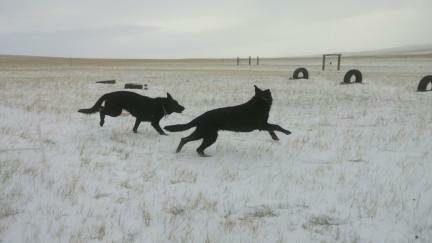 This mating will certainly produce larger sized GSD, not HUGE. But. Larger sized dogs. There should also be TOTALLY BLACK PUPPIES IN THIS LITTER. I already have a list started of people that want pups from this litter. We only take names, no money, until the pups are older and checked for health. We except deposits when puppy photos are up on the site. 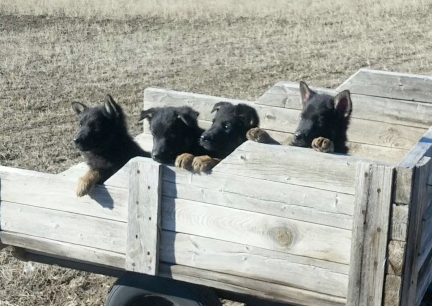 There is no obligation when putting your name on our 'interested in a GSD Puppy' list. Each of these two dogs have their own page here at this website. You can see many many many photos, of each since they were puppies, as well as see photos of them working here. You can read more about each dog on their own page, as well as find the link to each pedigree. First photo of Tychicus, second photo of Tabaliah, side views, but they are NOT Stacked, side views of their Natural Stance. We do ask for a ~$300.00 Non Refundable Deposits~ on a younger puppy to hold it for you til delivery; or before we will deliver a puppy. A puppy can be chosen from the photos and description we offer on each puppy and or, you are welcome to make an appointment to come and pick out your puppy in person. Our puppies often/usually are chosen and sold before they are 8 weeks old, BUT do not leave our Kennel until they are 8 weeks old. We except CASH OR PAYPAL. Paypal will except your Credit Card, Personal Check, OR Money Transfer. No puppy is held until payment is into our Paypal Account, Personal Checks so NOT clear for about 10 Days. Our Paypal account address sales@marnasmenagerie.com to send deposits to reserve your puppy, or purchase any of the many Animal Items I Craft and Sell. Because we are not Rural, we are way further out than that, we will offer delivery of puppies to Belle Fourche, Spearfish, and Rapid City. We would consider delivering puppies other places but there may be a fee involved. See www.faroutliving.com to get an idea of how far out we are. We are approx 2 1/2 hours from Rapid City and 6.5 miles out on a rough dirt road on the prairie, soil here is called Gumbo...it is very had to drive on a good day, not easy when damp, impossible when wet. MY EMAIL IS AT THE BOTTOM OF THIS PAGE, on the right, PLEASE PUT GSD PUPPY INTO THE SUBJECT LINE BEFORE SENDING AN EMAIL TO ME. THANKS! Photo of Texas Tea and her half sister, Turquoise, out playing in the snow early 2017. When the day comes to pick up your puppy there are some items you will need to take with you, there are some other items you MIGHT want to take with you, it depends on how far a drive it is from your home. You will NEED to take a couple of Bath Towels and or Older Blankets. Your puppy has probably never ridden in a vehicle before, at least not without the rest of it's family with it. Your new puppy might be scared and it will probably be stressed, it has just left everything it has ever known. That and the fact that many puppies get Car Sick, or Motion Sick, towels and or blankets can be very necessary for the ride home. 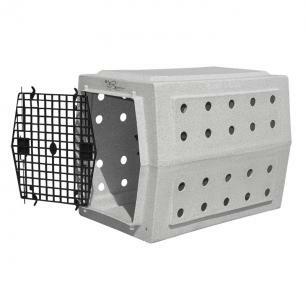 It is a good idea to take a Small Sized, think larger than cat sized, Animal Crate with Newspaper Liners and a Towel or Old Blanket over the Newspapers so the puppy does not slide around as badly. Your puppy, depending on how far of a drive it is, might need to get out and walk about and go potty on your way home. Take a couple of Small Plastic Bags with you for picking that mess up. Puppies normally have "two pees and a poop". Wait til your puppy does these three when you are walking it. Depending on the area and age of your puppy, it would be a good idea, and might be the Law in your area, to have a Collar and Leash for the puppy to walk on when you stop for potty breaks. (here at VonKamaier.com we provide these with the puppy and also work to train our puppies to know how to walk with them on). And if that puppy would happen to go potty or throw up on you.....you might want to carry a Change of Clothes with you also. Any time you are out and about with your animals, no matter how far, or close, you're going, be prepared for anything that can happen... you just never know. 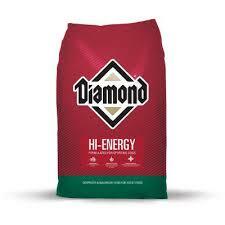 We feed Diamond High Energy Dog Food for all ages. We do not get paid for that advertising and we do NOT require that you feed your puppies from us any certain foods. We would however like to advise you to READ THE LABELS OF THE FOOD YOU DO BUY. Many times a 'High End' Dog Food is not quite as 'high end' as far as Nutrition as the commercials want you to believe. Also, you will want to switch Dog Foods slowly, adding the type the puppy was eating to the New Foods You Choose. A Dog Food too high in Protein can actually CAUSE Hip Dysplasia in large dogs. Many times a formula for 'all ages' is a better choice than a 'puppy food' formula. Please see that we have a page set up here at this site for 'Feeding'. You are NOT viewing 'German Shepherds' on our pages, German Shepherds would be a man/men from Germany that herd(s) sheep....a woman would be called a shepherdess. You are looking at Dogs from a Breed of Dogs that the word 'Dog' is in the Breed's Correct and/or Proper Name. 'German Shepherd Dog'. 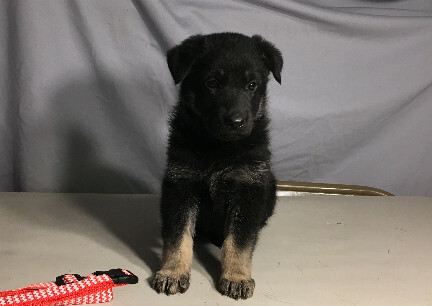 AKC Registerable 'German Shepherd Dog Puppies' are what we have for sale here. Our puppies are German Shepherd Dog Puppies. PLEASE VISIT OUR MANY PAGES HERE ON THIS SITE WITH INFORMATION ON WORKING GERMAN SHEPHERD DOGS AS WELL AS IDEAS AND TRAINING PAGES FOR IDEAS FOR TRAINING YOUR OWN DOGS (of any breed). 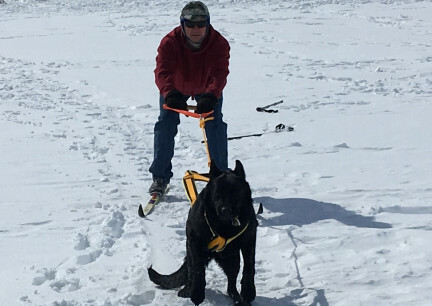 WE KNOW WE HAVE NOT COVERED EVERY JOB OR SPORT THESE GERMAN SHEPHERD DOGS PARTICIPATE IN. WE DID TRY TO COVER SOME THAT THE AVERAGE PERSON WAS NOT AWARE A GSD WOULD/COULD/DO EXCEL ENJOYING. 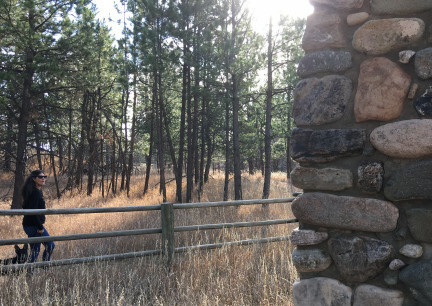 Photo of Marna with 14 week old Teanna on the Centennial Trail in Sturgis, SD, Thanksgiving 2017. OUR NEW UP AND COMING KENNEL SIRE! Our 'Up and Coming' new Kennel Sire, Tikuah. You can read more about him, see many photos and click on his VERY IMPRESSIVE Pedigree on his own page here on this site. You can read about the Sable Color in GSD on our Sable GSD page here too. And, as always. 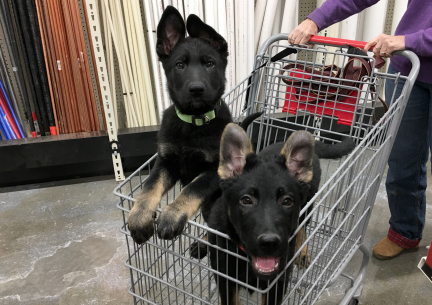 The contents of this page for GSD Puppies For Sale WILL REMAIN under construction. Please check back from time to time to see if we have puppies for sale.